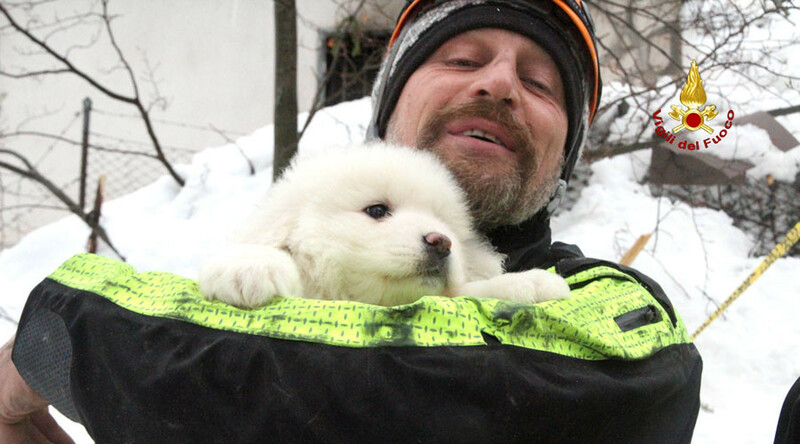 Three adorable puppies are safe and sound, albeit a little shaken, after 5 days under the rubble following the Abruzzo avalanche in Italy that has already claimed the lives of 12. Seventeen people are still reported missing after the avalanche levelled the Hotel Rigopiano in Gran Sasso National Park last week. Rescue operations are still in full swing. The Maremma sheepdog puppies were born on the hotel’s premises in December 2016. Their parents, the hotel’s resident dogs, Lupo and Nuvola (Wolf and Cloud), escaped the avalanche, but the pups got trapped. Once the crew pinned down their location in the boiler room, firefighters with access to the ruins quickly found the animals, raising hopes for more potential survivors due to air pockets in the rubble. You can watch the rescuers in the video as they carefully put the baby sheepdogs into their car to warm them up and send them away to safety. Following a quick (and positive) vet check, the puppies joined their parents in nearby Farindola with one of the hotel employees. True locals, the Maremma sheepdogs are indigenous to central Italy – particularly to the Abruzzo region.